Candidate member of the American Society for Surgery of the Hand. I believe the key to a successful outcome is involving the patient in the decision making process. Treatment begins not only with identifying the problem, but also understanding the goals each patient hopes to achieve and helping them make the best treatment decision based on those goals. Communication is an important component of care both for diagnosing a problem as well as ensuring each patient understands their treatment plan and what to expect throughout their recovery process. It is my privilege to care for patients and help them achieve the best outcome possible. 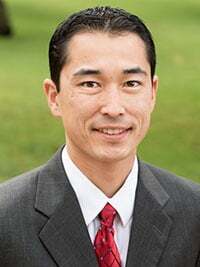 Dr. Tanaka enjoys the challenge and variety that upper extremity care provides, from common treatments such as carpal tunnel syndrome to more complex surgical procedures including total wrist, elbow and shoulder replacement. He also performs minimally invasive procedures such as wrist, elbow and shoulder arthroscopy to help return patients to activity as soon as possible. Dr. Tanaka works closely with each patient to present treatment options, understand the goals they hope to achieve, and help them make the best treatment decision based on those goals.